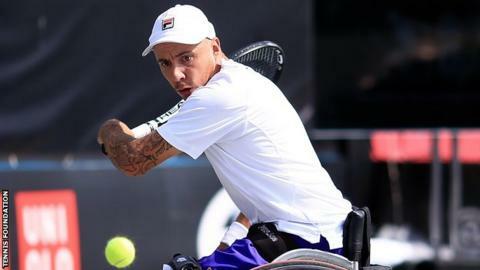 British wheelchair tennis player Andy Lapthorne secured a spot in another quad singles final at the British Open after a straight sets win. The world number three defeated Japan's Koji Sugeno 6-3 6-2 and will face world number one David Wagner. It is the fourth time in the past five years that Lapthorne has reached the final but he is still waiting for his first senior British Open title. However, fellow Briton Alfie Hewett missed out on the men's singles final. Hewett looked lacklustre in his 7-5 6-2 semi-final defeat by France's Stephane Houdet. He served for the first set at 5-3 but double-faulted on set point and was not able to recover from being broken twice at the start of the second set. Lapthorne started his semi-final strongly and raced into a 5-0 lead against world number five Sugeno before the Japanese player fought back. But the Briton secured the set - and after the first four games of the second set were shared, he pulled away with four games in a row to secure victory in the division where players have impairments in three or more limbs. "He [Sugeno] is a dangerous player; he has weapons from everywhere on the court, so that's why I was so pumped up, because if you drop your level even one or two notches he's going to strike," Lapthorne said. "I had to use my experience to get over the line and now it's all about looking forward to coming back and doing it all again in Sunday's final." Wagner recovered from losing the first set to beat Australian third seed Heath Davidson 5-7 6-1 6-0 in the other semi-final. The women's singles final will between the world's top two ranked players - and last year's finalists - Diede de Groot of the Netherlands and Yui Kamiji of Japan.